I have a few projects to share with you, but first I need to take some pictures and get that ol' ball rolling. In the mean time I thought I would reply to a very overdue question from a reader about our beautiful white sectional sofa. 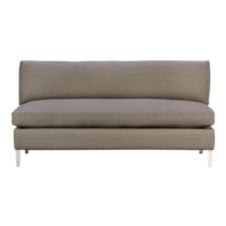 This sofa is called the cielo and it's from CB2. This was part of our HGTV Color Splash makeover picked by David Bromstad, and for those of you looking for a sectional we wanted to break it down for you and give you the scoop. 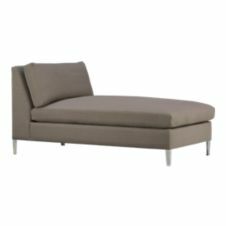 -It is a modular sectional and can be moved and adjusted piece by piece to fit your needs and the needs of your space. -It has a very clean and sleek look including the metal legs which we love. -It is a very high quality sofa and has a down cover over all the pillows. -I LOVE LOVE LOVE that there are 2 chaise lounges on this so that multiple people can kick their feet up. -I love that it is low to the ground and makes it feel very South Beach loungey. 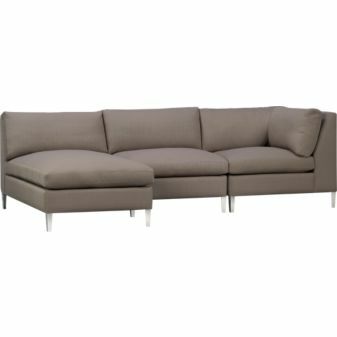 -It's easy to move around to get underneath and clean which is hard with sectionals that are all connected. -It is such a refreshing neutral color and therefor easily goes with any style and color scheme. -Since I love change, one day I will reupholster this sofa and the easy zippered cushions should make it a little less costly for me (I hope). -WHY ARE THERE ALWAYS DIRTY HAND PRINTS ON THE BACK!? -This baby was expensive! When I looked up the price for the sake of letting you know I added all the pieces together and came up with $4,693+ tax!!! Now this was something we won in our Twilight/Color Splash makeover, but still!!! I have to constantly flip and rotate the cushions since the down cushion covers get smushy and sunken. 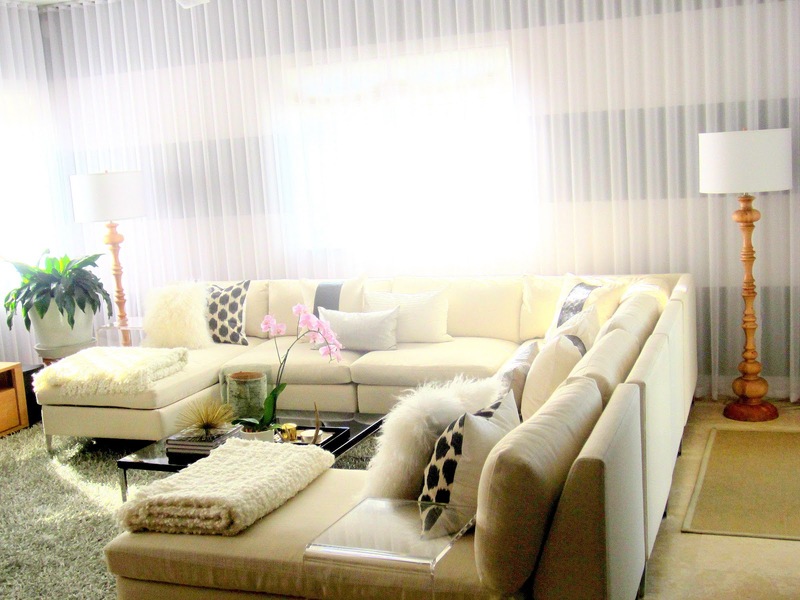 This doesn't bother me that much though because I would take the nice down fill over a traditional sectional ANY DAY. Overall rating: 4 stars Confortable, high quality, versitile. Though it's tough to keep an eye on this ALL THE TIME. I really love the sofa and it's quality. 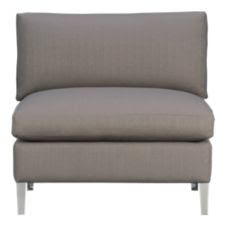 It does also come in a grey color and the price varies depending on the pieces you buy and how you put them together. 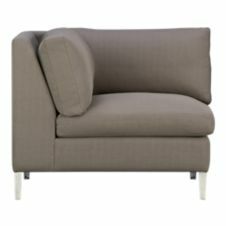 For me, since we didn't personally "pay" for this sofa I figure that one day I can reupholster it and make it more family friendly, however for the average person this wouldn't be an option at that price point. I'd say that this sofa in this color is for the single or older children families and would not be good for those with pets. It is costly so if price is a factor it may not be suitable for everyone, but remember that you pay for what you get and the quality is there (though I'm not sure worth that price). I know exactly what you mean about having a light color. My sofa always looks dirty and it drives me crazy. At least you didn't have to pay for your sofa and it is comfortable and stylish. I do think it looks pretty.